Matthias Arégui studied illustration at the School of Decorative Arts in Strasbourg, France. He created the picture book ABC des Tracas with Anne-Margot Ramstein and is working on his first comic book. He lives in France. Anne-Margot Ramstein studied art in Paris before joining the School of Decorative Arts in Strasbourg. She created illustrations for ABC des Tracas with Matthias Arégui as well as the children’s book Les Illuminations D’Albert Einstein. She lives in France. Crisply outlined digital images are tinted with muted pastels and splashed with warmer colors. Some are serious, others contain flashes of wit, and an air of scientific objectivity makes the humor even funnier. ... It’s a fascinating examination of the work that time does, and it offers new possibilities—and smiles —every time it’s read. A humorous, intriguing, fascinating, insightful look at the concept of before and after, including the small (such as the acorn and oak) to the more complex (the building of a city). Ramstein’s artwork has a fine-lined, almost Chris Ware–like sophistication, and the result will be readers, young and old, paging through the book multiple times, both for aha moments as well as hidden depths. The clean, subdued-palette digital illustrations make the connections crystal clear as identical objects are copied and recolored. ... Like many wordless books, this one is not meant to be shared in silence. The comments and conversations it provokes are at least half the fun. This harmonious album of clean-lined, very simple images in before-and-after pairs or short sequences practically compels viewers to ruminate about changes and seasons. ... Younger children will enjoy the mild challenge of figuring out the connections between, for instance, a slingshot and a broken window, a homing pigeon and an airmail envelope, a woolly sheep and (several steps and a knitted winter hat later) wood smoke drifting from a chimney in the snow. Peaceful, sometimes mildly humorous art provides gentle nudging toward a philosophical frame of mind. No words at all appear amid the stylish pictures and silent mirth of “Before After”... This chic volume invites children to make before-and-after connections between such things as a bean pod and a bar of chocolate, and a chicken and an egg. 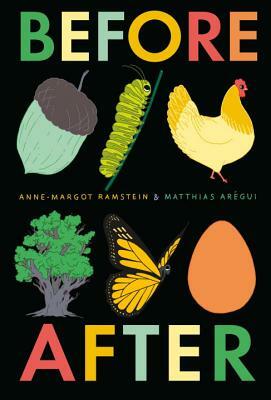 Here in careful, elegant matte illustrations, each one to a page, Anne-Margot Ramstein and Matthias Arégui invite children (and grown-ups) to see the before-and-after connections between such things as berries and a cup of tea, a rocking horse and a rocking chair, and, amusingly, an egg and a chicken, and a chicken and an egg. This innovative picture book would be a great addition to the children’s section of a library or a classroom because of the critical thinking it can elicit. A clever, wonderfully illustrated book. This popular book of clean, elegant illustrations is simple enough for the youngest non-reader to follow (before: caterpillar, after: butterfly), but clever enough to engage older children as well (before: slingshot; after: broken window). Beautifully precise drawings... With 176 pages to pore over, this top-notch work won't leave grown-ups feeling shortchanged like many other picture books do.